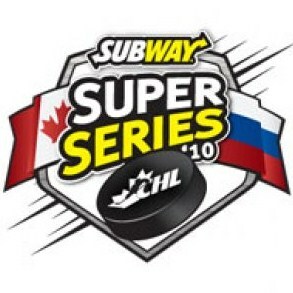 The road to this winter’s World Junior Championships continues, as the Subway Super Series is now underway. For the past seven years Russia has sent over a team of junior level all-stars to play a six-game series against the Canadian Hockey League (CHL). It’s a pretty straight forward tournament, with two games each against the QMJHL, OHL and WHL. Besides the international aspect of the event, it also serves as a key component to Team Canada’s evaluation process for their final roster that will be assembled prior to the World Junior Championships in late December. As reported previously, several Kings prospects will be competing in this series over the next two weeks – including three players in the opening pair of games. Defenseman Nic Deslauriers (drafted in the third round, 2009) and goaltender JF Berube (fourth round, 2009) are part of the Quebec team. While, forward Maxim Kitsyn (sixth round, 2010) is skating for Russia. Overall, the CHL had won 36 of 42 games since it began in 2003, including a clean sweep last fall. More specifically, entering play yesterday the QMJHL had a record of 9-5 against the visiting Russians. In game one last night, Team Russia prevailed 5-4. Their goaltender, Dmitry Shikin, made 36 saves including 16 in the third period. MM: Tell us about the overall experience. Did you enjoy it and was it a little easier to play this year, given that you were part of the series last year too? ND: This year I was more confident, having played last year. Last year, everything was all new for me. I think getting a little more experience by that made the game a little easier. Plus, I learned a lot of stuff during the summer by going back to LA for camp. I just learned a lot, so the game was easier for me. Just being able to play in the Series twice has been amazing. This year you’re also serving as one of the assistant captains. How did you find out and was that something that gave you another boost of confidence? I found out at the morning skate. We went to take the team picture and I my jersey had a ‘A’ on it. I was happy, but was kinda surprised too. The coach told me part of the reason was because I’m a hard working guy and all the work I’ve done to prepare for the World Junior Championships. I think that was a real privilege for me. Just having that letter does give me more confidence. I think it maybe made me step up my game more too, giving me more responsibility on the team. I was certainly happy to find out. I couldn’t ask for more than that. Let’s talk about your performance a little. You scored a goal to put your team up 2-1. For those who didn’t see see the game, tell us how the play developed. It was shorthanded, right? Yes, it was short handed. (Nathan) Beaulieu had the puck behind the net, he rimmed it. A defenseman caught it. (Philipp) Danault took off and it was kind of a little race between him and the D. I just joined the rush. He tried to deke and he got hit. I got the puck in the zone, almost on a a breakaway. I did a backhand, top shelf. I crashed the net and it was a nice goal I think. Sounds like it. Now, overall you were a +1 on the night. However, you were on the ice for a goal just 17 seconds into the third period that allowed Russia to tie the game. Those first minute goals are killers. What happened out there? I think they came out super fast, with lots of speed. It was sort of a three-on-two. The guy came from the outside and tried to cut at the net. I tried to hit him, he shot and there was a rebound. The back door guy scored. It was a very quick play. They had a lot of speed on that goal. With Gatineau (his regular junior team) you’re off to a pretty hot start so far this year, 17 points in 17 games. Are you feeling more comfortable in their system than you did last year with the Huskies (he was traded in the off season) or do you think its just part of you continuing to develop as a player? I think it’s just the experience. It’s my fourth year, so the games get a little easier. Andre (Tourigny of Rouyn-Noranda Huskies) and Benoit Groulx (of Gatineau) are kinda the same coach a bit. They’re a hard coach and everything. It fits right with me. I think it was perfect for me to go to Gatineau with a hard coach like that. And I think having four years in the league makes you more confident. At 16 years old you’re kinda stressed out a bit. I feel confident now. That helps me a lot with my game. I’m not shaky with the puck, just keep it to simple plays. That’s helped me a lot. Back to last night, two other Kings prospects were in the game with you. Berube played the second half of the game in net for your team. How did he look? I think he looked good. For sure we didn’t help him at the start of the third. He made a couple of key saves though. I think it’s kinda hard for a goalie to jump in halfway through the game like that. I think he played well overall. I know you’re on different teams there in the ‘Q’, but do you guys talk at all now that you know each other a bit from attending camp together in Los Angeles? For sure, we talk and text. I haven’t played against him yet this year, but we keep in contact. Maybe once a week we text a bit. After meeting in LA we’ve tried to remain friends, it’s a good thing. We can talk a lot because we’re in the same league. So, having contact with him and knowing what’s going on with him is great. We’re going to play them often in the second half of the season. On the other side last night was Maxim Kitsyn (2 goals, 1 assist, +2). Besides the three points, what did you notice about him out there? I knew him a little bit from Kings camp too. I think he just worked hard last night. He was probably one of the best Russian players. He had speed and he was there to work. You could tell he had a plan for the game. I talked to him a little bit on the ice – you know, little smiles and everything. I think he played a good game. When I talked to him in LA he seemed like a good guy. So, I was happy for him to play a good game like that. Game two is coming up tomorrow night. Have the coaches or the players talked at all about the adjustments they want to make for that game? Not yet really. We’ll probably cover that tomorrow. Everybody knows it was sad to lose to the Russians. But, I think everybody also knows what we have to do – like, step up our play and bear down a bit. We missed a lot of shots too. Maybe things will turn our way. I’m sure we’re going to talk about it later today and tomorrow morning. I think we have a good team. We just need to bear down and take advantage of the chances we get, like with rebounds. Final question, what type of pressure were you playing under knowing that a lot of the Team Canada scouts were watching and will be using this as part of their evaluation for who gets to play at the World Junior Championships? I didn’t think about it at all. I tried to approach it like it was just a normal game. I didn’t want to think about anything else. I think I played a good game. By approaching things like a normal game I just said ‘what’s going to happen will happen.’ My focus was on giving 110% out there. I wasn’t distracted by all the scouts or anything else out there. A huge thanks to Nic for his time today. We truly appreciate it. Game two is scheduled for Wednesday at 4pm PST. You can watch the game for free online (click here for details).